Introduction: Tobacco accounts for the largest number of preventable deaths. Along with creating awareness and educating people regarding the ill effects of tobacco on health, it is necessary to have laws regulating the sales of tobacco and its product. Cigarettes and other tobacco products act give the regulations for it. Aim: The aim of this study was to conduct an audit of the point of sales (POS) tobacco advertising and assess compliance with advertising ban in Bengaluru city. Materials and Methods: A cross-sectional observational study was conducted over a period of 2 months. 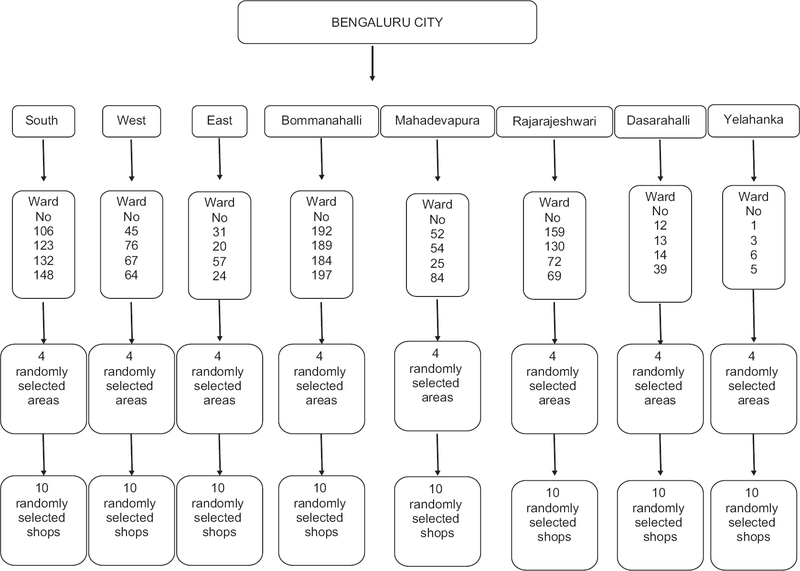 Data were collected from stores in urban areas from eight zones of Bengaluru city using multistage random sampling. Four wards were randomly selected from each of the 8 zones, 4 areas were randomly selected from each ward and 10 shops were randomly selected from each area in the ratio of 1 supermarket: 1 liquor store: 3 convenience store: 5 tuck shops. Results: Results indicated that the 93.9% of the existing shops were not within the 100 yards of any educational institute, 75.8% of them had product showcasing, 81.9% of the stores had boards displayed promotional message, 30.6% had tobacco logo at POS, 93.6% of the stores had more than one interior advertisements, 85.25 of the stores had product placement <1 m of snacks counter, 88.2% of the stores did not display warning signage, 88.3% of the stores did not display no smoking signage, and 85.7% of the stores did not display no smoking area or smoking here is an offense. Conclusion: The results of the present study suggested that there is a lack of compliance with tobacco advertising ban among stores selling tobacco in Bengaluru city. POS advertising has become strategic locations for tobacco companies to advertise their brands. Tobacco control laws aim to eventually eliminate all direct and indirect advertising promotion and sponsorship concerning tobacco. For the prohibition of advertisement and regulation of trade and commerce, production, supply and distribution, the law was established in the year 2003 called “The Cigarette and Other Tobacco Products Act” (COTPA). According to the Section 3 of COTPA prohibits any tobacco promotion and states that no person shall promote or agree to promote the use or consumption of cigarettes or any other tobacco product. National legislation prescribes following provision with which every public place must comply, namely, the display of no smoking signage, absence of active smoking, nonavailability of smoking accessories and aids such as ashtrays, matchboxes, and lighter. Even though there are laws established, but how far these have been enforced and implemented is a challenge which is faced by people and authorities. Results from the previous studies conducted by other researchers in various cities such as Ahmedabad, Chennai, Moradabad, Vadodara, Mohali, Delhi, and Mumbai showed that the stores complying with the laws for point of sale (POS) in stores on average were <50%.,,,,, Literature available for the same in Bengaluru city is very limited. Hence, the aim of the present study was to conduct an audit of POS tobacco advertising and assess compliance with the advertising ban in Bengaluru City with the objectives: to assess if there are any violations related to provisions of POS advertisements of tobacco and comprehensive tobacco control legislation in Bengaluru City and to document the number of exterior and interior tobacco advertisements and to survey tobacco product placements within stores. This was a cross-sectional observational study conducted over a period of 3 months that is from the month of January 2017 till the month of March 2017. The ethical clearance was obtained from the Institutional Review Board of The Oxford Dental College (Ref. No. 192/2016–2017). The urban area of Bengaluru city by Bruhat Bengaluru Mahanagara Pallike standards were divided into eight zones, namely, South, West, East, Bommanahalli, Mahadevpura, Rajarajeshwari, Dasarahalli, and Yelhanka. From each zone, four wards were randomly selected and from each ward, four areas were selected randomly further from each area, 10 shops were selected. The shops were selected in ratio of 1:1:3:5 (1 supermarket: 1 liquor shops: 3 grocery shops: 5 small shops). This proportion was done based on the pilot study conducted in one area and this area was excluded from the sample. A total of 1280 shops were included in the study [Figure 1]. Data were collected from various stores in Urban area of Bengaluru City using a pretested and validated questionnaire. Multistage random sampling was done. Questionnaire used was formulated from Section 3 and 5 of COTPA. The questionnaire was designed to be filled by thee investigators which contained a total of 8 items, each item contained multiple options and appropriate option pertaining to individual stores was selected. Example: Type of store with options – large stores/supermarket, grocery/convince stores, liquor shops, and small/tuck stores [Annexure 1]. The results showed that 46% of the shops were tuck shops, 28% grocery shops, 14% were liquor shops, and 12% were supermarkets. 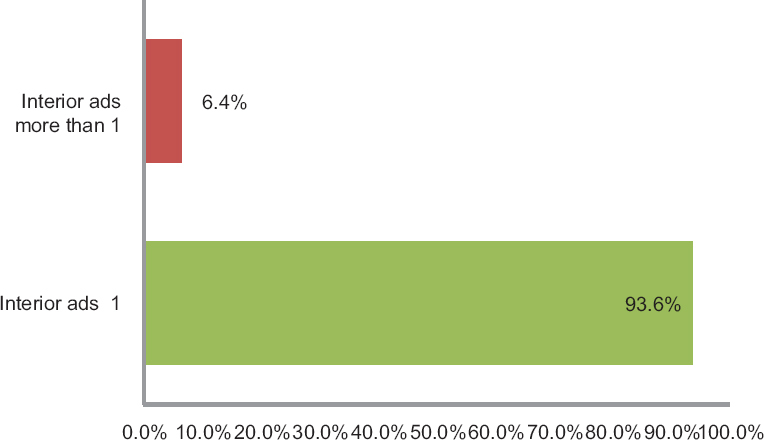 Shops located in the residential areas were 48.1%, 47.8% of the shops were in commercial areas, and only 4.6% were located in the industrial areas. Stores selling loose cigarettes accounted around 80%, whereas 64.9% were selling beedis, chewable/smokeless type of tobacco and only 47.7% were selling cigarettes in packets [Figure 2]. Section 6 (b) of COTPA states the prohibition of cigarettes and other tobacco products in the area within 100 yards of any educational institutions and the compliance regarding the same was seen in 93.9% of the shops. There were various kinds of advertisements such as signage, boards, and product showcasing. About 75.8% of the stores had product showcasing, 50.2% of them had board display, while 4.1% of the stores had product dangles. The shops which had boards as display 57.6% of them did not have brand logo while 42.4% of the boards had brand logo of which 89.3% of the boards were displaying brand names and 10.7% of them did not have a brand name. Shops that had promotional messages on their boards were 81.1%, while 79.4% of the boards had advertisements extending to the full board, 30.6% of the shops had exterior logo at the POS, and 82.8% of these shops had more than one exterior advertisement. Stores with interior advertisements [Figure 3]. The stores that did not display the warning signage in an Indian language as applicable and warning signs occupying the top edge of the board in a prominent manner were 88.2%. Only 24.2% of the stores displayed “Tobacco causes cancer.” Only 18.5% of the stores displayed “Tobacco kills”. Only 10.6% of the stores displayed health warning signage at the entrance to public places, only 7% of the stores displayed health warning signage at conspicuous places inside. The stores that did not display the warning of “no smoking area-smoking here is an offense” were 85.7% and 88.6% of the stores did not display the in-charge person. Product display within stores is shown in [Figure 4]. The results showed that 46% of the shops were tuck shops, 28% grocery shops, 14% were liquor shops, and 12% were supermarkets. Of these, 48.1% were located in the residential areas, 47.8% of the shops were in commercial areas, and only 4.6% were located in the industrial areas. Stores selling loose cigarettes accounted around 80%, 64.9% were selling beedis and chewable/smokeless type of tobacco, and only 47.7% were selling cigarettes in packets and in a study done by Pimple et al., the results showed that 51.3% of tobacco outlets had visible stacking and open display of tobacco products for sale and 41% of tobacco outlets were found displaying gutka and pan masala packets in violation to ban. This result in the present study was seen because of the strict regulations of the law and making tobacco vendors comply with the law. There are various kinds of advertisements such as signage, boards, and product showcasing. About 75.8% of the stores had product showcasing, 50.2% of them had board display while, and 4.1% of the stores had product dangles which was in accordance to a study done by Goel et al. (2014) where 51.1% of the shops had product showcasing, 49.6% of the shops had dangles, 33.8% had stickers, and 27.1% of the shops had display boards. The shops which had boards as display 57.6% of them did not have brand logo while 42.4% of the boards had brand logo of which 89.3% of the boards were displaying brand names and 10.7% of them did not have a brand name. Shops that had promotional messages on their boards were 81.1%, while 79.4% of the boards have advertisements extending to the full board, 30.6% of the shops had exterior logo at POS, and 82.8% of these shops had more than one exterior advertisement and according to a study done by Pimple et al., a 43.2% of the stores exhibited hoardings with brand packs, photos, and brand names in violation to Section 5 of COTPA. The stores those displayed of 1–2 interior advertisements were 55.6%, 93.6% of the stores displayed interior advertisement of more than 1, and 92.5% of the stores displayed interior advertisement of more than 3 and according to a study done by Pimple et al., there were 48.6% tobacco outlets exhibited more than two display boards. 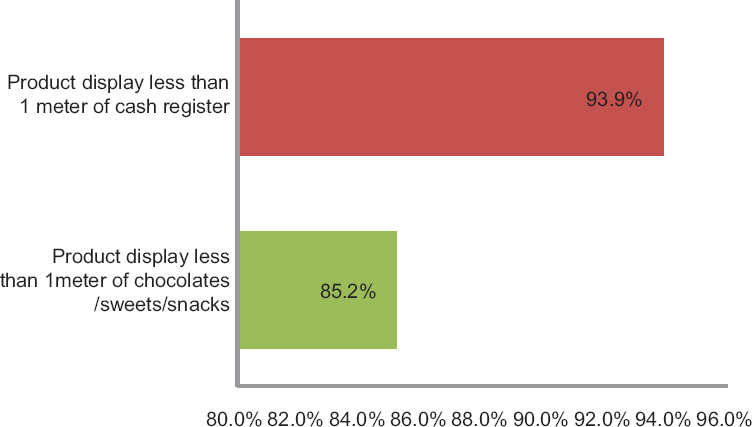 Product display was <1 m of the chocolates/snacks/sweets counter in 85.2% of the stores and product display was <1 m of the cash register in 93.9% of the shops and was in accordance to a study done by Goel et al. (2014) in which 57.7% of the shops had display within the 6 inches of eatables. The stores that did not display the warning signage in an Indian language as applicable and warning signs occupying the top edge of the board in a prominent manner were 88.2%. Only 24.2% of the stores display “Tobacco causes cancer,” and the results were similar to a study conducted by Pimple et al. where it was seen that only 25.2% of the places with POS had display of health warning signage. Only 18.5% of the stores display “Tobacco kills.” Only 10.6% of the stores displayed health warning signage at the entrance to public places, only 7% of the stores displayed health warning signage at conspicuous places inside according to a study done by Goel et al. (2014) where it was seen that <50% of the places had signage boards with health warning and they were placed at conspicuous places. The stores that did not display the warning of “no smoking area-smoking here is an offense” were 85.7% and 88.6% of the stores did not display the in-charge person. In the present study, it was seen that 50.2% of the shops had boards as display and was seen that in a study done by Goel et al. and Chaudhry S et al. ( 2007) tobacco advertisement boards fully satisfying the POS provision were practically nonexistent. As there is no database available regarding the registration of all the shops selling any form of tobacco, it is difficult to access all the shops for compliance, hence is a limitation of the present study. The results suggest a lack of compliance with tobacco advertising ban among stores selling tobacco in Bengaluru city. POS advertising has become a strategic location for tobacco companies to advertise their brands. Tobacco advertisements make quitting very difficult. Tobacco industry uses innovative tactics to circumvent the law, especially so when there is partial ban backed by limited enforcement. Tobacco products and advertisements are often placed near candies and children's items at the front of the store and countertops – encouraging children to see them as harmless everyday items. Tobacco products often occupy large and prominent display space in stores and are strategically designed to encourage impulse purchasing and promote certain brands while making health warnings less visible. The loopholes in the specifications for the boards make the size permitted by law meaningless and defy the purpose of putting health warning on the board. In this study, it was seen that maximum compliance was seen when it came to placement of stores selling tobacco within the 100 yards of an educational institute and it was owing to the fact that there was strict patrolling closing down the shops and restricting it from opening again. Considering the impact of POS advertisement and promotion on increased smoking/tobacco initiation and use, there is an urgent need of effective implementation of comprehensive ban on advertisements at POS. To regulate the business of tobacco selling and ensuring that tobacco vendors comply with the provisions of COTPA, there must be a mechanism for compulsory registration and licensing as done by excise department in regulating liquor in India. Name, designation and contact number of in-charge person should be mentioned below the signage (minimize size of 60 cm by 15 cm of white background) Yes/No. Available from: http://www.who.int/tobacco/surveillance/gyts/en. [Last accessed on 2018 Jan 24]. Available from: http://www.searo.who.int/entity/noncommunicable_diseases/data/ind_gyts_fs_2009. [Last accessed on 2018 Jan 24]. Available from: http://www.searo.who.int/entity/noncommunicable_diseases/data/ind_gats_report_2009_2010. [Last accessed on 2018 Jan 24]. Ministry of Health and Family Welfare, Government of India. Cigarette and Other Tobacco Products (Prohibition of Advertisement and Regulation of Trade and Commerce, Product, Supply and Distribution) Act-2003, Delhi: Ministry of Health and Family Welfare, Government of India; 2003. Goel S, Kumar R, Lal P, Sharma D, Singh RJ. Refining compliance surveys to measure the smokefree status of jurisdictions using the Delphi method. Public Health Action 2013;3:342-5. Pimple S, Gunjal S, Mishra GA, Pednekar MS, Majmudar P, Shastri SS, et al. Compliance to Gutka ban and other provisons of COTPA in Mumbai. Indian J Cancer 2014;51 Suppl 1:S60-6. Yadav R, Swasticharan L, Garg R. Compliance of specific provisions of tobacco control law around educational institutions in Delhi, India. Int J Prev Med 2017;8:62. Mistry R, Pimple S, Mishra G, Gupta PC, Pednekar M, Ranz-Schleifer N, et al. Compliance with point-of-sale tobacco control policies in school-adjacent neighborhoods in Mumbai, India. Am J Health Promot 2016;30:433-40. Chaudhry S, Chaudhry S, Chaudhry K. Point of sale tobacco advertisements in India. Indian J Cancer 2007;44:131-6.